Do you want to be emailed every time you make a trade? 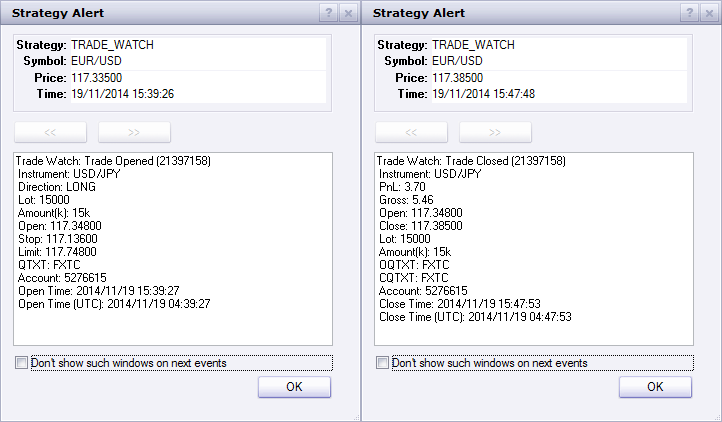 Tired of creating new instances of the built-in Watch Trade signal every time you make a trade? If so, then Trade Watch is for you. You only need to create one instance of this signal and it will watch all trade activity! Want to only send alerts for a particular symbol or trades opened and closed on a specific account, no problem! Not interested in Opened trades and only want alerts for Closed trades – no problem! Trade Watch allows you to easily configure any of these options. This indicator is only compatible with FXCM’s Trading Station Desktop. Additionally, an FXCM account is required (including free FXCM demo accounts). FXCM is an independent legal entity and is not affiliated with John Colonna or MooMooForex. MooMooForex is not owned, controlled, or operated by FXCM and John Colonna is not an employee, agent or representative of FXCM..